Are you heading to Las Vegas, Nevada for a cannabis vacation? Well if you are we have a few tips to help you have a great 420 friendly vacation. Nevada was the sixth state to legalize recreational cannabis use for adults 21 and over making Las Vegas that “sin city” we have come to know. #1 – Finding 420 friendly Las Vegas lodging – So after you have figured out the dates you want to go and vacation in Las Vegas during, you’re going to have to find some lodging. 420 friendly hotels in Las Vegas are very few and far in between. The problem is, if a establishment allows gaming on their property then cannabis use is prohibited on that property. This is a little known Nevada gaming regulation that was passed when recreational cannabis sales and consumption was legalized. Some of these places allow smoking inside the room, others only have places outside for you to smoke at. So make sure you find a lodging option the best works for you. We have sourced out a few hotels that are cannabis friendly that you can stay at, the link is here. #2 – Las Vegas cannabis tours – To tour or not to tour, that is the question. 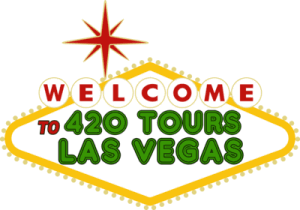 Las Vegas 420 tours can be a fun experience for those wanting to see how the cannabis industry works in Nevada. These tours will take you to a commercial cannabis grow, production facilities and out shopping for some tasty products. They range in price is anywhere from $50.00 up to a $100 or more. One caveat about Las Vegas marijuana tours are you are not able to smoke on the transports, as Nevada made it illegal to consume cannabis in any transportation/vehicles when recreational cannabis became legal. Now if you have already seen one grow you probably have seen most grows so if you’re familiar with the industry and how things work you might wanna skip a Las Vegas cannabis tour. You can also find a 420 friendly airbnb for your stay there too. #3 – Finding recreational cannabis dispensaries near you – So when you arrive in Las Vegas and are all booked in your hotel, the first thing you’re probably want to do is find a recreational cannabis store so you can purchase some high grade cannabis products. These stores will also have small pipes so you can consume any bulk buds that you may have purchased. These are cheap enough for you to just throw away before you head back home. Just be sure not to take any used smoking accessories as in most states these will be considered paraphernalia and can get you in trouble. Having a nearby store for you to keep your supplies stocked is key in having a great cannabis vacation. Make sure you use our site when you’re there as that will tell you the nearest store to you to make it easier for you to restock. Following these three tips can help you have a seamless and memorable 420 friendly vacation while you’re in sin city. You can find great places for your munchies while your in Las Vegas at this link. Find Munchies in Las Vegas. Make sure you visit our travel tips section to find more chips on how to make your cannabis vacation a great experience. Don’t forget to eat at some of the best restaurants as well. And make sure to pick up some moon rocks of cannabis also, they will knock you out.